Edgy funky cool. All qualities in a collection that I love. This was right up my street. Layering, leather, draping…oh I loved it. The designer duo managed to merge great design with a large collection of fabrics. Key pieces and my personal favourites were a Burberry-esque leather and sherling jacket, leather shorts, a monochrome print jumpsuit and tie dyed leggings. Perhaps a some overuse of the same tie dyed monochrome print across several pieces, but the rushing, asymmetrical lines of the dresses and structure of each individual piece made the collection flow beautifully. I would take a stab in the dark and say that this was casual chic (stylist speak) at it’s best. One to watch. Wow. Who would have known that these two sisters would produce such an inspiring collection. I spoke to the girls backstage after the show where they told me that nature had a lot to do with it. Feathers, leather, embellishment, flowing chiffon brought their vision to life. They wanted to use fabrics that glided giving the illusion of movement within each piece. The Turkish born designer defined himself with this collection and has graduated as an official force. With people like Twiggy and Laura Whitmore in the audience, he’s got an eclectic following. Well constructed pieces which mixed a palette of silvery grey with splashes of green gave a masculine edge to the collection but this was juxtaposed with soft fabrics like chiffon. A lot of rushing and even the odd bustle added an air of the old to this very contemporary collection. My favourite was a high neck green chiffon blouse which really stood out on the catwalk. Although there was construction the clothes were fluid and danced around the model’s petite frames. And with a soundtrack that included Marilyn Manson’s version of Sweet Dreams, the industrial and harsh undertone to the collection became vivid. Ah. The best for last. This was crazy if you don’t mind me saying so. Firstly the celebs were out in force. 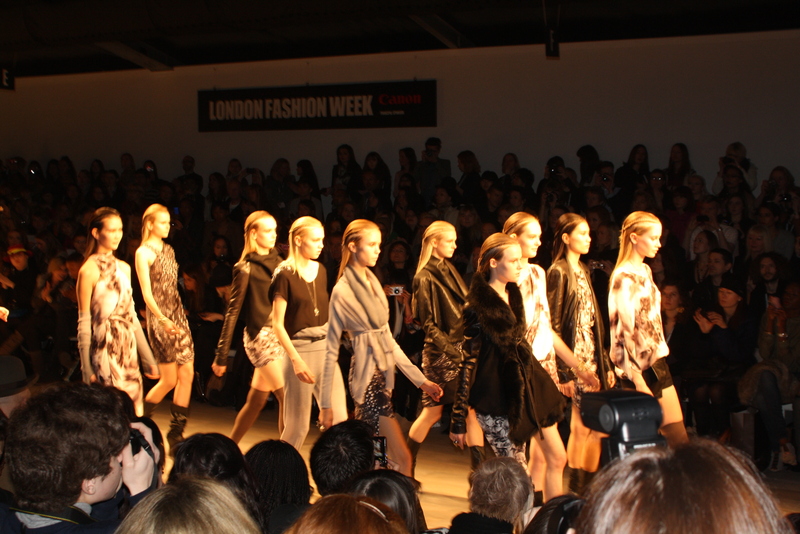 After a quick costume change after Bora Aksu, Laura Whitmore took her position on the front row and I parked myself beside her to have a chat about London fashion and the week in general. Dressed in a combination of Galliano, Manoush and Kurt Geiger shoes, she looked every bit the part of fashion week. Now that she’s a London native, we chatted about the differences in the industry between Ireland and the UK. You can see the full interview on http://www.stylenation.ie over the course of the next week. I also got talking to actress Jamie Winstone, who was just lovely. Head to toe in PPQ and with a splash of red lipstick, she said that she’s a massive fan of the label. The collection is not for the weak hearted. The out-there feel was appealing in that it grabbed your attention from the get go as the models stomped to Nicki Minaj and Lil Kim. Amazing black headpieces set off each outfit. Velvet and leather, purple and black, PPQ means imagination. Day one over. 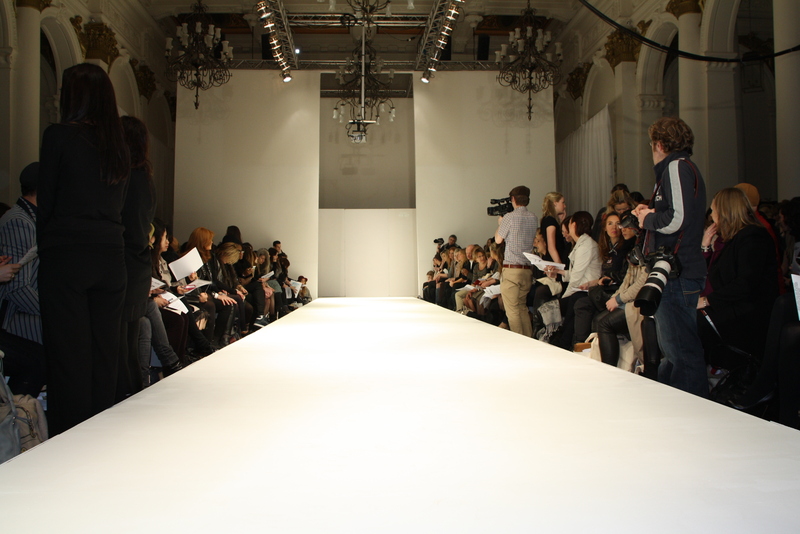 To come tomorrow…John Rocha, Betty Jackson, oh and ….HOUSE OF HOLLAND. Oh yeah. It’s fashion week baby. If you can get drunk on fashion…then I’m hammered.